In 496 BC, sixty school children were massacred on the beautiful Aegean island of Astypalaia. The perp was Cleomedes, a fellow islander. After killing his opponent in the Olympic boxing final, and consequently being refused the prize by the umpires, he went ‘insane with grief’, sailed home, and brought the school roof crashing down on his compatriots’ children by removing its load-bearing pillar. The ancient Greek travel writer Pausanias relates that the islanders tried to catch Cleomedes, but he mysteriously disappeared. Then comes the difficult bit: the bereaved community was ordered by the Delphic oracle to deify the killer and sacrifice to him. The ambivalent status of Cleomedes is telling. 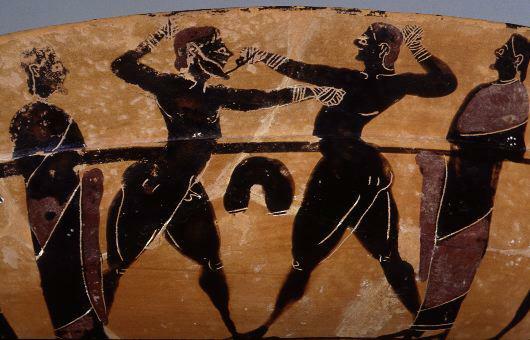 The ancient Greeks were indeed conflicted about violent crazies. They wept bitterly when their children were slaughtered: a few decades later, they were outraged when another school massacre took place, in which every child in the town of Mycalessus was wiped out by mercenaries high on their own prowess. Yet male education consisted of military training, contact sports, and poems celebrating over-armed individuals with anger management problems. 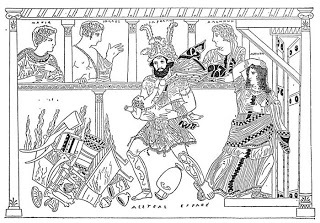 Heracles came home from his labours to kill his wife and three children, whom he psychotically misidentified as Bad Guys, with a club and an archery set. Odysseus used a stockpile of similarly low-tech weapons to slaughter a hundred neighbours whose only crime was to eat the contents of his larder. We are just as conflicted about violence-addicted lunatics as they were. 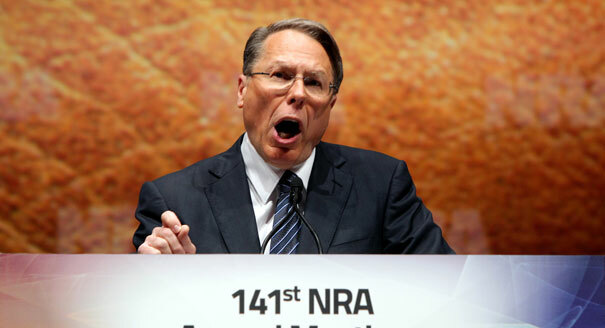 If we add automatic firearms to ancient mythology the result is the fantasy war-game going on inside Wayne LaPierre’s head. Only one word in that sentence has more than one syllable. LaPierre has clearly been watching the virtually dialogue-free Rambo IV (2008), on which purported ‘script’ Sylvester Stallone boasts that he collaborated. The Burmese troops who have killed the children in the village are mashed as in a food processor by Stallone’s jeep-mounted .50 calibre BMG. I am told by people who have actually counted that the body parts of over two hundred Bad Guys are smeared over the camera lens during the movie. 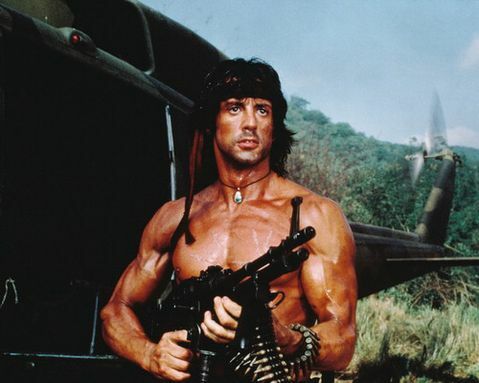 The NRA’s rhetoric is identical to the ‘argument’ of Rambo IV. 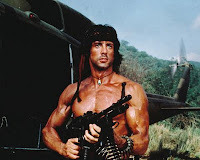 Rambo must fire his ludicrous weapons because some do-gooding Christian medics, along with pettifogging bureaucrats, have made a dog’s dinner of the mission. The NRA likewise position themselves as selfless heroes whose realistic pragmatism is the last resort when pathetic do-gooders fail. Disturbed youths responsible for mass shootings are the modern equivalents of Cleomedes. Yet, paradoxically, gun-worshippers are also the modern equivalents of the bereaved Greek parents who agreed to worship Cleomedes as a legendary strongman. Come to think of it, Stallone has also acted a semi-deranged boxer, in the Rocky movies. In a sleepless moment it occurred to me that our own bafflingly bipolar approach to indiscriminate violence would receive its ultimate expression if he starred in a movie about Cleomedes, boxing champion, murderous psychopath and hero, called e.g. Last Blood: Aegean Sacrifice. The only barrier is that ancient Greek concepts as well as names tend to have more syllables than Rambo fans are used to. I don't own a gun and am not a member of the NRA. I think there should be changes to tighten up the law on large magazines, and game makers should take some responsibility in their products. I would like to add that you should be ashamed for using the old trick of using the worst possible photo of the person in your crosshairs on your blog. That's very childish of you actually. Also, it's nice that you added your own words to what La Pierre actually said. He didn't say "heavily" armed guards. And the attack on using words with one syllable is really a reach. It's liberals like you that make it hard for a dialogue to take place with people on the other side of the aisle so real change can take place. Just how Funny is Homelessness?